Silver pendant inlaid with Australian opal and sugilite. Beautiful turquoise wedding and engagement ring set in sterling silver. 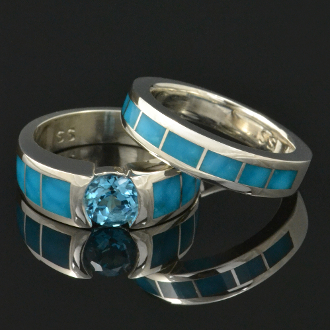 Both the engagement ring and the wedding ring are inlaid with blue Kingman turquoise with a birds eye pattern. The engagement ring has 3 pieces of turquoise inlaid on each side of a center set blue topaz. The 1 carat round topaz is set almost flush with the silver and the color looks great with the blue turquoise. The engagement ring is 6.2mm wide at the top and tapers slightly down to 4mm at the bottom. The matching wedding ring is inlaid with 7 pieces of turquoise that perfectly match the turquoise in the engagement ring. The wedding band is 4.5mm wide at the top and tapers to 3.8mm at the bottom. These rings are available as a set or may be purchased seperately. The topaz and turquoise engagement ring would also make a great stand alone wedding ring if you are not interested in a two ring bridal set. A matching man's band is also available to match the set. Special orders usually take 3 to 6 weeks to complete so please schedule your order to allow us plenty of time to create your rings and ship them to you. This set is available in other inlay materials by special order- just ask! Other center stones are also available for the engagement ring. White sapphire and Moissanite diamond upgrades are listed but there are many other gemstone choices available. *We recommend upgrading to Continuum sterling silver for all wedding ring purchases. It offers more durability and superior tarnish resistance compared to standard sterling silver.